Cologne - A clean sheet in the first game after promotion is no bad return at all, and 1. FC Köln goalkeeper Timo Horn was rightfully delighted to have kept out the likes of "" in his side's 0-0 draw with Hamburger SV at the Rheinenergiestadion. However, in conversation with bundesliga.com, the 21-year-old shot-stopper made it clear that the point was only the start for Köln, as he expects to build on their positive performance on Matchday 2 against VfB Stuttgart. bundesliga.com: Mr Horn, how tough was the adjustment from the Bundesliga 2 last season to the Bundesliga this time out? How long did you need in order to find your way into the game? 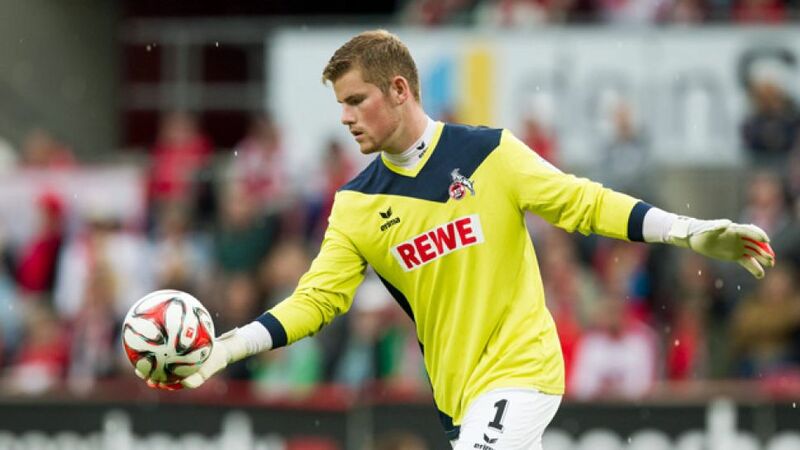 Timo Horn: You certainly need a couple of minutes. The difference between the Bundesliga 2 and the Bundesliga is marked. Even just in a tactical sense, HSV pressed high and made it difficult for me to play it out from the back. That needed a bit of adjustment and we had to get used to it. Players like Rafael van der Vaart and Pierre-Michel Lasogga are a different class when they’ve got the ball. Saying that though, we had the game under control and gave away very little. We could maybe have been a touch more incisive going forward, and even though it was ‘just’ a draw, we can certainly say that we’ve arrived in the Bundesliga. bundesliga.com: With the one exception being Yuya Osako, Peter Stöger sent your Köln side out unchanged from the side which won promotion last season. The defensive unit remained exactly the same. Was that an advantage? Horn: It’s always an advantage when you’ve played together before. We were excellent defensively last season [Köln only conceded 20 goals in 2013/14] and we continued in the same vein against Hamburg. The other two centre-backs who have come in [Tomas Kalas and Mergim Mawraj], however, are doing a good job and will certainly be required at Bundesliga level. As a goalkeeper, I’m not worried about our defence; we know we can carry on in the same fashion. We’ve got more quality to show going forward than we did against HSV, that’s for sure. bundesliga.com: How, then, would you judge the draw? Was it a fair result, or, in hindsight, a bit frustrating? Horn: No, not frustrating. Anthony Ujah did have a good chance, but he couldn’t quite finish it off. HSV also had good chances though; I remember one in particular from Ivo Ilicevic. It was pretty even, overall. Hamburg were better in the first half, and we were better in the second. We’re happy with the point. bundesliga.com: You’re playing Stuttgart on Matchday 2. 1. FC Köln are unbeaten in Stuttgart since 1997, a run stretching back nine games. How do you view that one? Horn: We’re expecting a similar game to the one against HSV. We know that last season, Stuttgart didn’t achieve what they could have, or wanted. If we go there to attack aggressively and defend well, then we’ll have a good chance. bundesliga.com: You’ve been spared any of last season’s top half in your first three games (Hamburg, Stuttgart, SC Paderborn 07), does that make settling into the Bundesliga any easier? Horn: Those big games will come along once we’ve got the away games against Stuttgart and Paderborn out of the way. It certainly could have been a worse start, I’d agree. If you’re coming into the Bundesliga and playing FC Bayern München or Borussia Dortmund straight away, then it’s a different game entirely. We’re not going to hide from anyone, though, and we’ll go into each game with plenty of respect, but no fear. I don’t think we’ll need too long to acclimatise to the Bundesliga. We’re bringing plenty of self-confidence with us after promotion last season, and as I said earlier, I’ve got no worries.